Requirements were valid effective April 1, 2010 - December 31, 2010 ONLY. This Historic Merit Badge could be earned only during calendar year 2010, in honor of the 100th anniversary of the Boy Scouts of America. It was first offered in 1911 and discontinued in 1952.
or unit management software file uploads provided. It also applied to unit advancement processors using Internet Advancement.
. Troops could submit advancement reports for Historic Merit Badges earned by Scouts before December 31, 2010 through March 31, 2011. BSA had a special program in honor of the 100th anniversary of the founding of the BSA, which included the reintroduction, for 2010 only, of four Historical Merit Badges - Carpentry, Pathfinding, Signaling, and Tracking. An overall goal of the program was for a majority of the BSA’s registered Boy Scouts to earn one or more of the merit badges during the centennial year, 2010. The badges offered had a history that can be traced back to the origins of the BSA. The original requirements were used, as well as supported by scanned pages of the early merit badge pamphlets so a Scout could view what a Scout 100 years ago used. 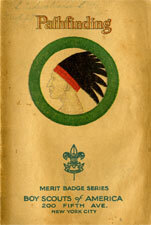 Supporting the scanned pages of the original pamphlets were information guides for each merit badge that explained what a Scout of 1910 might have experienced, along with background information to assist a Scout in understanding what may be unfamiliar terms. The contemporary merit badges closely resemble the original designs of their counterparts with the exception of the border, which is gold. The unique border will immediately identify them as 2010 historic merit badges. The four historical merit badges could be used toward a Scout’s rank advancement if they were earned by December 31, 2010. The effective date for earning these new merit badges was April 1, 2010, and requirements had to be completed no later than Dec. 31, 2010.. These are the original requirements written in 1911. NOTE: These requirements differ from the original draft requirements previously posted on this web site.